Facing off in California’s Senate race with incumbent Senator Barbara Boxer this November is Carly Fiorina, whose biggest claim to fame is nearly driving HP into the ground. Earlier this month Fiorina made the rookie-like mistake (made by newbies and veterans alike) of saying something offensive, inappropriate, or stupid near an open microphone; in her case by having good schoolgirl fun with Boxer’s hairdo. How “yesterday” indeed. There is little new with Fiorina’a pushing emotional buttons in an effort to mislead voters and get elected. The connection between terrorism and “the weather” presumably exists in Fiorina’s mind, but belies how woefully unprepared Fiorina is to lead at the national level. 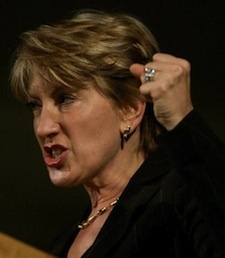 By mocking Boxer’s statements that climate change is “very important” to national security, Fiorina dismisses the established research, most notably from the Department of Defense and the Center for Naval Analysis (whose work began under the Bush administration), clearly implicating climate change as a serious potential threat to national security. Here easy dismissal of such a threat brings into question just how Fiorina would go about bringing a sustainable, comprehensive, long-term plan addressing such a complex and multi-layered issue. As deadly serious as terrorism is, there is more to national security than a crazed terrorist with a death wish. And there is more to leadership than playing on people’s fears. Fiorina’s lack of understanding of the full scope of national security issues is reflected in a statement by an aide regarding the attack ad. The statement is correct in that it is not about climate change at all, most especially since it refers to “the weather” and presumably someone in Fiorina’s camp must understand the distinction between climate and weather. But just like the verbiage of the attack ad, Fiorina’s aide makes a leap of illogic by implicating “misplaced” priorities as a connection between climate change, terrorism, and national security. If it is truly her belief that climate change either is not real or has no bearing on national security, it would be marginally better if at least Fiorina exhibited the intellectual prowess and honesty to distinguish between climate and weather. But instead she takes the most politically expedient – if entirely misleading – angle, while attempting to distance herself from the very politicizing and pandering from which she engages. If Fiorina is serious about national security, she should understand the issue is broad and complex, realize that a secure nation is not a fearful nation but is one that reflects that broad understanding, and that real change will not come about through attack ads, misrepresentation of issues, and exploitation of voters’ fears.